Title: 'Le Globe Terrestre Represente en Deux Plans-Hemispheres, et en Diverses autres Figures...' Published by Nolin. Copper-engraved double-hemisphere map of the world, surrounded by smaller hemispherical and oval maps, hand-colored in outline. Significant world map at the end of the 17th century, with California depicted as an island, on the main map as well as three of the smaller maps. Australia is partially delineated, as also New Zealand, and above the island of California is a blank space, with Terre de Jesso to the west. Shirley describes the map, and its origins, at some length: "One of Coronelli's most active collaborators in France was the Frenchman Jean-Nicolas du Tralage, also known as De Tillemont. Information was exchanged between Coronelli and Tillemont and maps were published based on the acknowledged input of both parties. Such an example is their joint world map consisting of two main hemispheres and eight smaller projections. 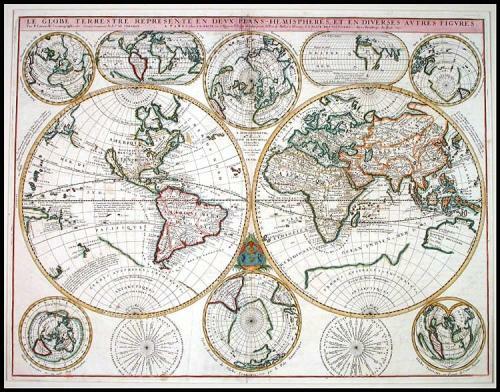 This was first published by Jean Baptiste Nolin in 1690 and would appear to pre-date Coronelli's own world map on two separate sheets in his Atlante Veneto. The geographical features generally follow those shown on Coronelli's globe of 1688, including the marking of the Mississippi. There are none of the interesting legends and vignetttes and naturally far fewer place names. However, the Solomon Isles have been included which were surprisingly omitted from Coronelli's predecessor map. The engraving is commendably precise and clear. Around the two main hemispheres are two smaller ones oriented on Paris and its antipodean opposite; north and south polar projections; one cordiform and two truncated oval projections; and two wind directional figures." This is the first state (of at least four) of the map, with the 1690 date present, and the dedication to Monsieur Louis de Boucherat. Additional creasing along the centerfold, a few other creases, old ink writing on the verso, a few verso paper repairs, tiny hole and darkened spot near the Strait of Anian, some mild soiling, still very good, a scarce and important map.